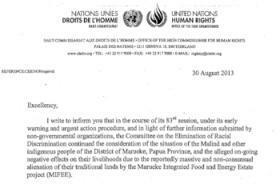 The letter, which is addressed to the Indonesian Ambadassador to the UN office in Geneva, refers to reports which describe the continuing irreparable harm inflicted on the Malind and other affected indigenous peoples of Merauke due to land seizures and the use of forced labour, among other impacts. In August, 27 Indonesian and international civil society organisations submitted a complaint to the CERD, calling for suspension of the MIFEE project, which was officially launched three years ago. The CERD letter reiterates concerns expressed in its previous letter to Indonesia (September 2011). It also includes requests for information, by 31st January 2014, about measures to implement the Constitutional Court's decision of May 16th on customary forests and progress with enacting the Draft law on the Recognition and Protection of Indigenous Peoples. The full letter is attached in PDF format below. 1 See also 'Starvation and poverty in Indonesia: civil society organisations appeal for suspension of MIFEE project in Papua pending redress for local communities', Press Release by FPP, Pusaka, Sawit Watch and Down to Earth, September 2nd, 2013.